I'm not a real fan of corporate name sponsorship. I simply can't keep up with the names of Candlestick Park and whatever they're calling the stadium where the Lakers play in Los Angeles. 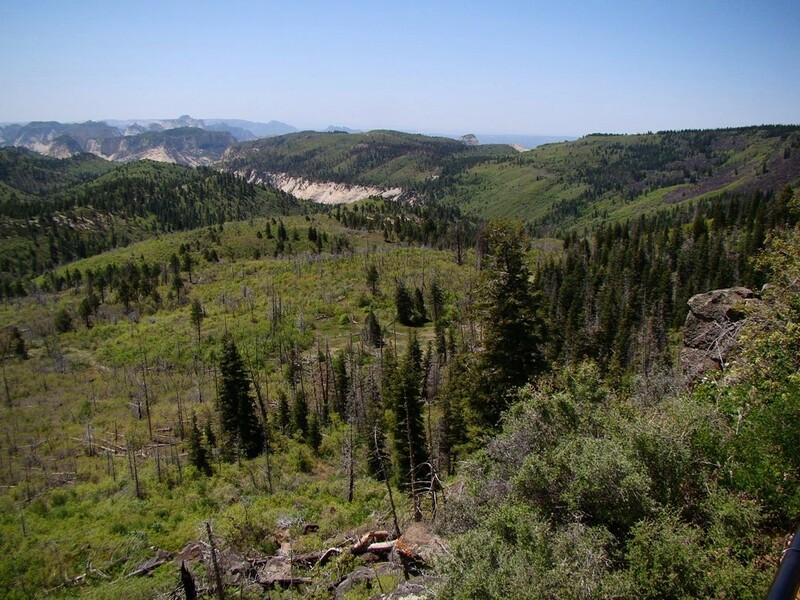 When one hears the name of the little-known state park in Utah, it sounds like another case of corporate sponsorship gone crazy. 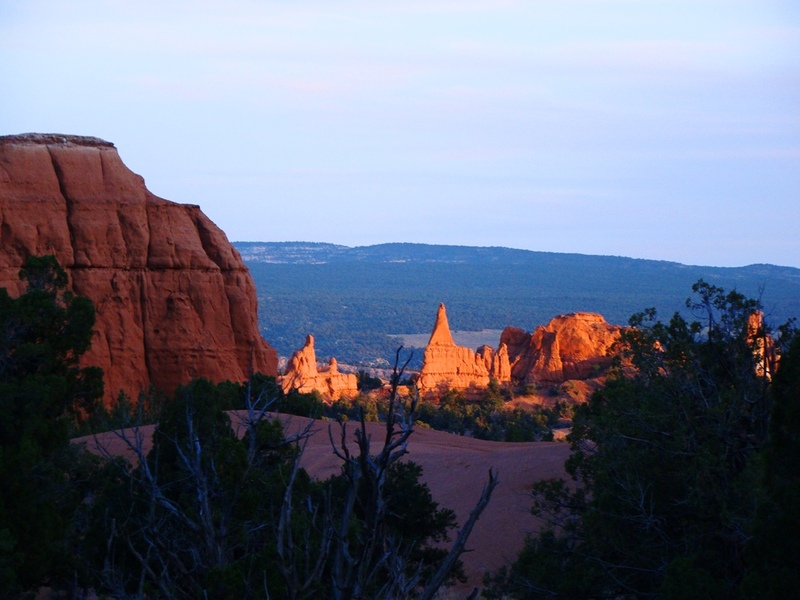 But as I understand it, the story of the naming of Kodachrome Basin State Park was a bit more nuanced. It's funny how a name can change the meaning and significance of a place. A hundred years ago, only a few ranchers and local Native Americans had ever even seen Kodachrome, and the ranchers referred to it as Thorny or Thorley's Pasture (I'm operating off dim memory here), and the beautiful valley was quite literally unknown to anyone from outside the region. In the late 1940's an exploration party from the National Geographic Society came through the region (imagine still exploring the United States only half a century ago! ), and they were impressed with the scenery. They used their influence to rename nearby Butler Arch for their director (the arch is now called Grosvenor Arch). They gave the basin its name for the vivid color for a new bright film variety from Kodak. The article in National Geographic brought a lot of attention to the region, and tourists started seeking it out. I must say I don't get corporate thinking sometimes either. Apparently Kodak was not happy with the copyright infringement, so when Utah sought to make a state park out of the basin, they called it Chimney Rock State Park. Kodak finally wised up and realized what a free marketing opportunity they had, and consented to calling the park Kodachrome Basin. Over the years they have provided some support to the park. The park has outlasted the product; Kodak produced the last roll of Kodachrome film in 2009, and the company is struggling to survive in the digital age. The park has two main attributes: the colorful Jurassic sedimentary rocks, and the strange columnar towers called sedimentary pipes. 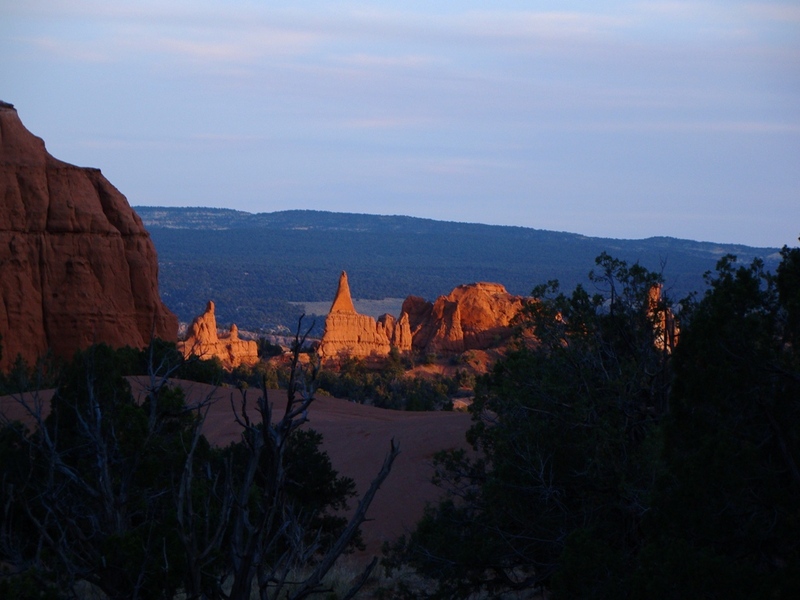 The sediments are mostly members of the Entrada formation, which is responsible for some spectacular scenery in other parts of the Colorado Plateau, most notably at Arches National Park and Goblin Valley State Park. The bright orange layers are the Gunsight Butte member, while the high white and red striped cliffs are the Cannonville member, and the light tan layers are the Escalante member. 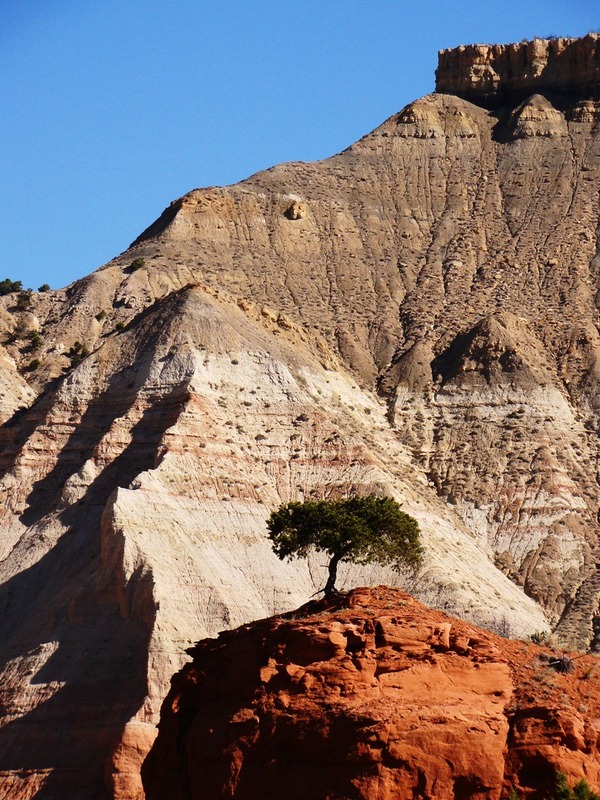 The highest cliff ramparts are composed of Cretaceous Henrieville and Dakota sandstones. Lower parts of the basin expose Jurassic Carmel formation, most notably the Winsor member. The odd pipes occur mostly in the Winsor member, and the overlying Gunsight member of the Entrada. The sedimentary pipes are one of those interesting mysteries that crop up in geology every so often. 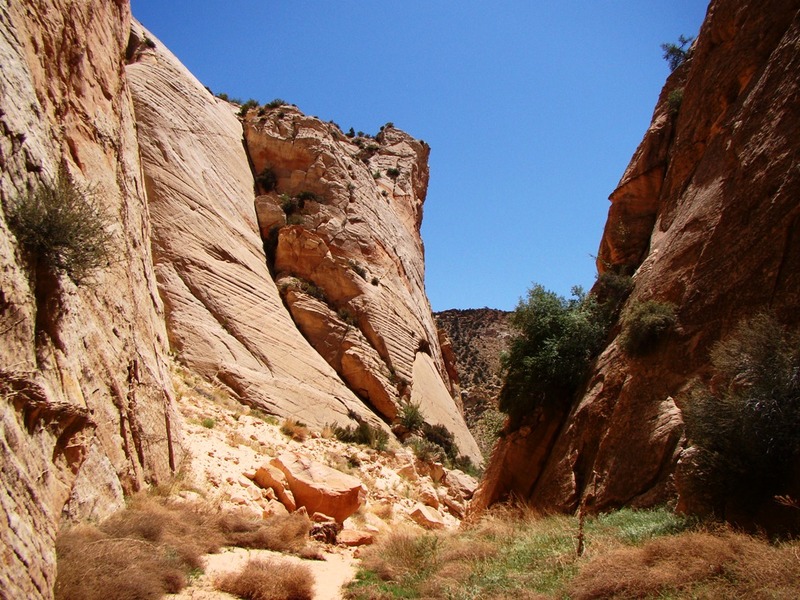 They are composed mostly of a slurry mix of sediment from the lower members of the Carmel, and penetrate the Entrada. There are around four dozen of them in and around the park, and they range in height from 6 feet (2 m) to 170 feet (52 m). They are composed of more highly cemented rock, so as the sediments are eroded away from around them, they end up standing out. It has been suggested that they are the result of hot spring activity, and that they might have been pathways for geysers (some have suggested that the park is sort of a Yellowstone in reverse). This is an intriguing and imaginative idea, but what was the source of the heat? There are no magma intrusions in the immediate region, and in other parts on the Colorado Plateau where intrusions do occur, such pipes aren't found (that I know of). Another possible explanation is that the pipes are liquefaction features, places where water rushes towards the surface from saturated layers below during the shaking from earthquakes. I've liked this explanation in the past, since there are a few major fault zones just a few miles away. But researchers say there is a time problem. The latest studies suggest that the pipes are very old features: they don't penetrate the overlying Henrieville sandstone, and are therefore probably Jurassic or early Cretaceous in age. 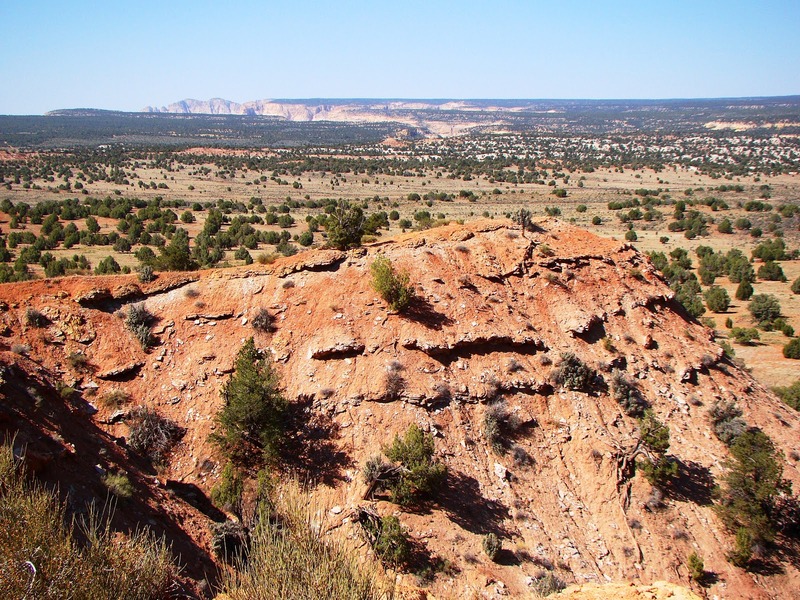 The faults in the region didn't become active until less than about 15 million years ago. I still like this explanation though...everyone knows that one's favorite hypothesis has to be the right one...I think. The most recent suggestion is that the pipes formed from lenses of groundwater trapped in sabkha deposits, layers of evaporites like salt or gypsum along arid environment shorelines, which formed the Paria member of the Carmel formation. As younger sediments were laid down on top of the older layers, the pressure grew in the groundwater deposit, and water squeezed out, following the path of least resistance, generally upwards. This model has the virtue of being supported by most of the evidence...but I repeat the end of the last paragraph. The park is a pleasant place to explore. In addition to the colors and unusual pipes close at hand, there are beautiful vistas to be had. On our reconnaisance trip a few weeks back we hiked out to Shakespeare Arch in a remote corner of the park. The short trail included panoramas of the White Cliffs to the southwest, the high cliffs of Navajo sandstone found around Carmel Junction and Kanab. To the west, the pink strip on the horizon is the Claron formation, the Pink Cliffs of Bryce Canyon National Park. We could also look up the slope to Kodachrome Basin itself. All in all a very colorful landscape. The state of Utah has worked hard to make Kodachrome a destination for campers. The small 28 unit campground has flush toilets and showers. They sell firewood. And get this: when we arrived at our campsite, it looked like someone had raked our campsite. Feng shui in the wilderness! There is a small general store, a few rental cabins, and a new visitor center. If you have a large group, you can reserve one of two group campsites: the older Oasis site has been a favorite of ours for many years. The Arches site is newer, but is in an isolated corner of the park, with fewer facilities. 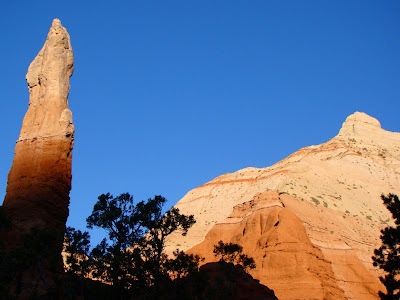 I've had many commenters say that Kodachrome is their favorite campground on the Colorado Plateau. I put it near the top of my list, too. We'll be stopping at Kodachrome during the AAPG tour that I am leading in July. If you want to join us, get the information here. An excellent resource: Baer, J. and R. Steed. 2010. Geology of Kodachrome Basin State Park, Kane County, Utah. In Sprinkel, D.A. et al (eds. ), Geology of Utah's Parks and Monuments, Utah Geological Association Publication 28, 3rd edition. Salt Lake City: Utah Geological Association, 467-482. Shakespeare Arch is one more attraction in an already attractive place. It's at the end of pleasant half mile hike. 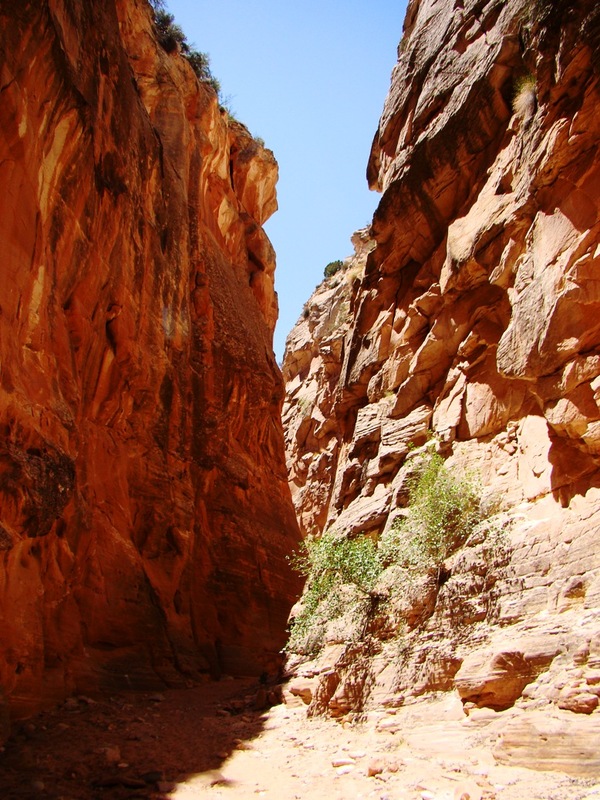 Candyland, Narrows, Rockfalls and Vertical Rocks: What does any of this have to do with Grand Canyon? A gravel road in Utah runs 41 miles from Kodachrome Basin State Park to Highway 89 near the village of Big Water. Why take the trouble to follow it when there are nice paved highways to get to Zion and Bryce and the other national parks in the region? If you are interested in geology, there are lots of reasons: an intimate look at the feature that forms the structural boundary of eastern Grand Canyon, for one, and an inordinate amount of spectacular scenery, including a latter-day version of Jurassic Park in full color, and some delightful hikes through narrows and slot canyons. 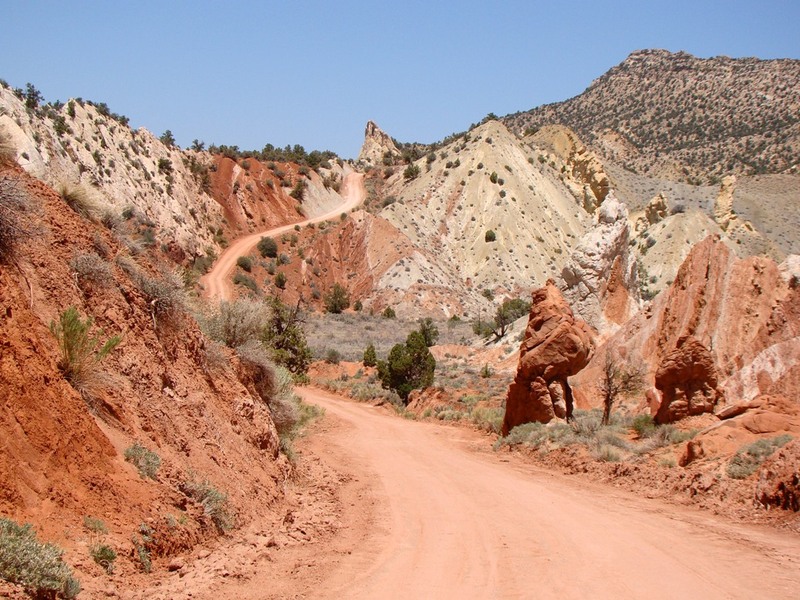 It's one of the few roads that bisects Grand Staircase-Escalante National Monument, the biggest park in the region, even larger than Grand Canyon National Park. And for the engineers, a couple of very cool rockfalls, one very recent. I found it fascinating enough that I'm intending to take my geology tour through the region in July, assuming the road isn't closed by flash flooding (here is the info, if you are interested in attending). Cottonwood Wash Road follows the trace of the Cockscomb, the northern end of the East Kaibab monocline, the structure that defines the eastern side of the Grand Canyon. 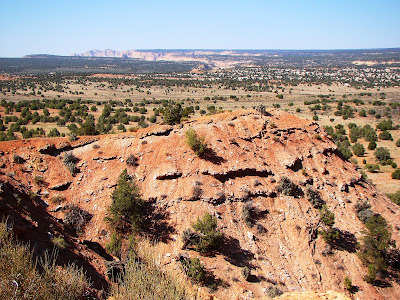 A monocline is a type of fold in which one side of a fault at depth has risen, slicing through the rocks below, but not breaking through the overlying sedimentary layers, rather like a rug draped over a stairstep. 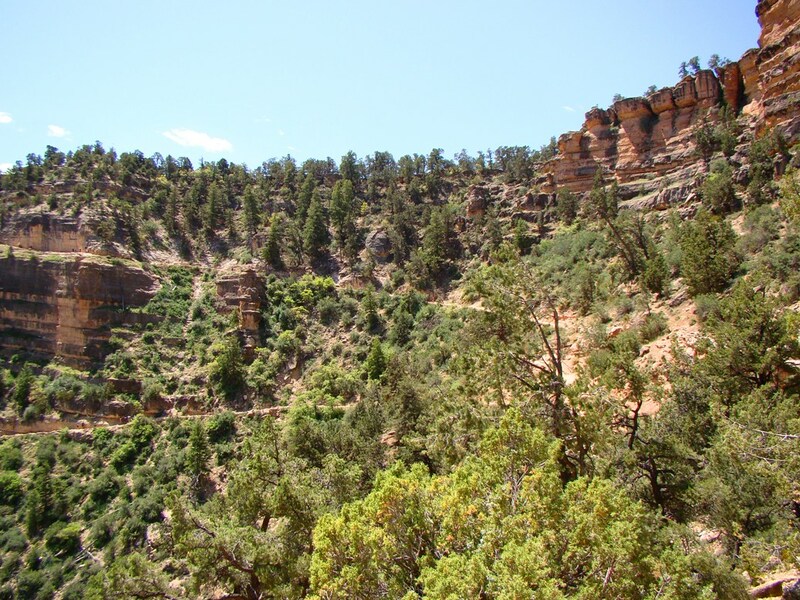 At Grand Canyon, the East Kaibab monocline has formed the Kaibab Plateau, which the Colorado River had to slice through to form the deep gorge we see today at the national park. 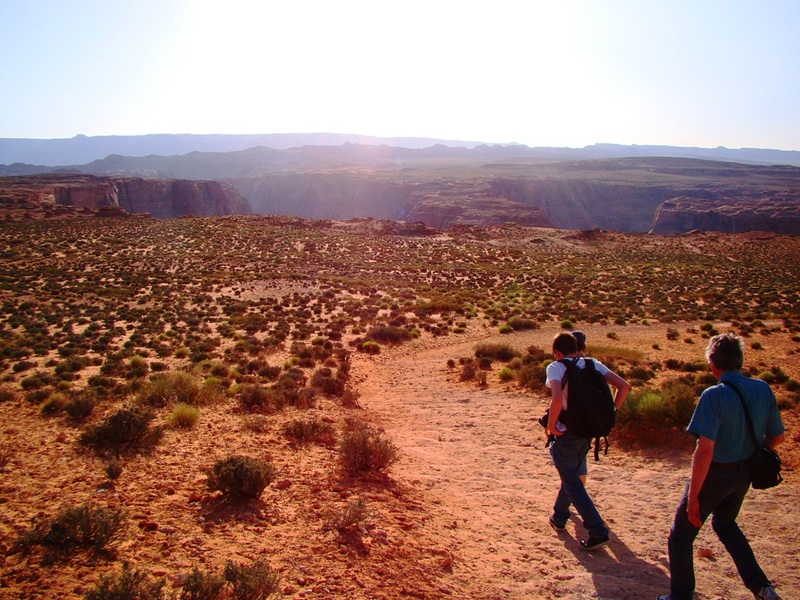 Along the Cockscomb, there is no Grand Canyon, but erosion has exposed the heart of the monocline and the Jurassic-Cretaceous sediments that it displaced. 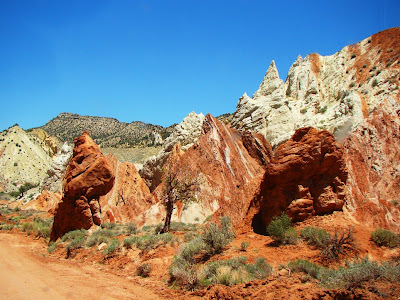 For much of its length, the road follows a strike valley along the monocline, where erosion has selectively removed the softer clay-rich rocks like the Tropic shale or parts of the Carmel formation. 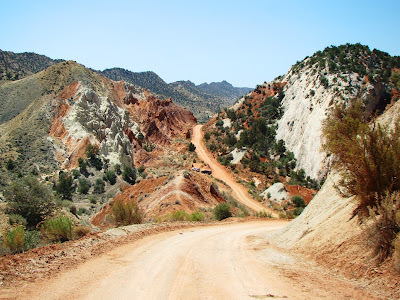 In addition to being easily eroded, the shales are readily deformed and stretched, and along one particular stretch of the road called the Squeeze, the rocks are mostly vertical and highly contorted. The area, about 20 miles in from the north, or 25 miles from the south, is locally called "Candyland" for the bright colors, especially red and white. 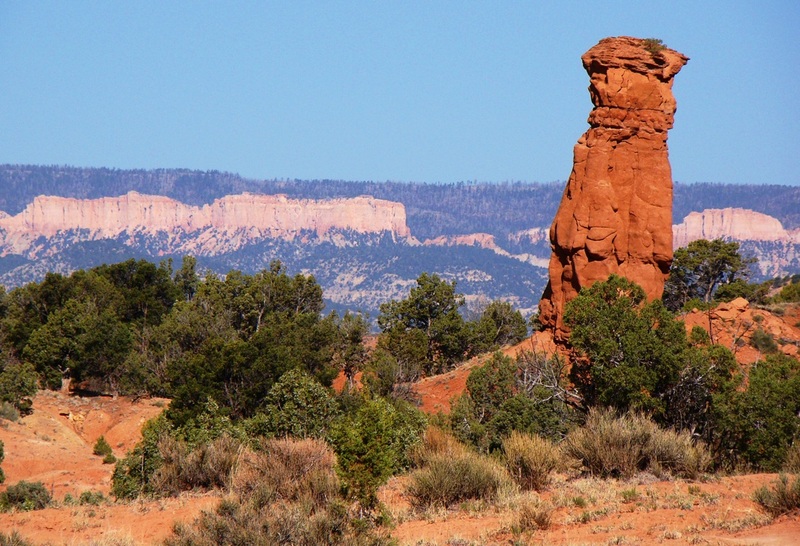 A unique rock formation next to the road is named "Santa Claus" (below). 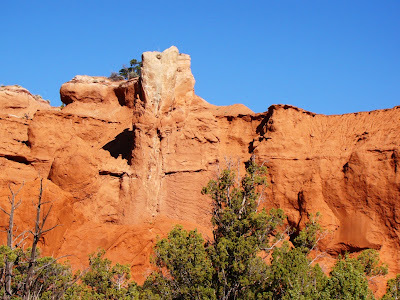 The Navajo sandstone and other sandy layers are exposed along the road, forming bold cliffs, and when watercourses cut through, deep slot canyons and narrows. 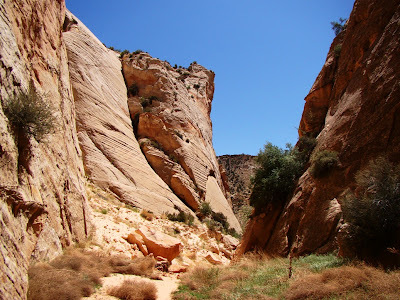 A most delightful stroll can be had along the 1.5 mile long Cottonwood Wash Narrows. 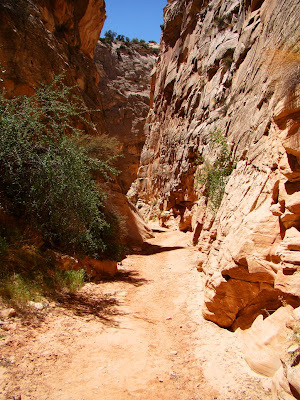 The trail is a primarily a sandy wash and is easily hiked with only a few areas of scrambling around rockfalls (more on that in a bit). At the north end of the narrows, you actually have a choice, to go upstream a few hundred yards in the narrowest canyon (above), or to walk downstream 1.5 miles through the deepest part of the narrows (below). I'm always a good sport about these kinds of things. I'd do both! I was in a big rush during my reconnaisance trip last week, but I walked the lower end of the Narrows, and quickly explored the upper end as well. I was there at high noon, so there was no experimenting with the glow of reflected sunlight in the deepest parts, but I found the scenery to be spectacular nonetheless. At the lower end, the rocks look...kind of wrong. The towers of Navajo sandstone lack their normal "beehive" appearance, and instead look kind of spiky (upper center in the picture below). At this point they have been stretched and deformed, and somewhat broken up by the folding process. I wondered if slope stability was a problem where rocks have been messed up in this fashion (more on that in a second). If you don't have anyone to shuttle you, it is a simple 20 minute stroll along the road through Candyland back to the beginning of the Narrows. 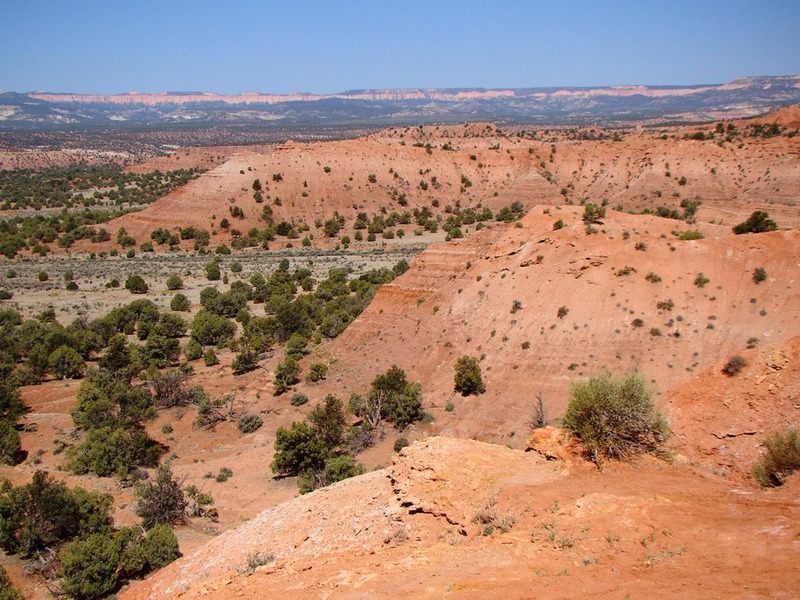 All in all it is a nice introduction to structure and erosional processes of the Colorado Plateau in a compact area. About that slope stability business...at the lower end of the Narrows, the path is blocked by a rather large rockfall deposit (below). 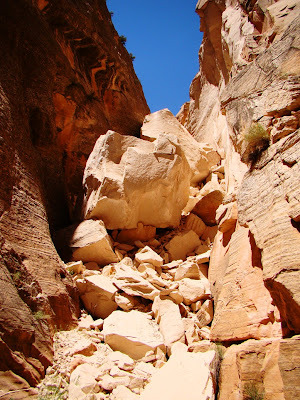 The fall filled the canyon floor, so the hiker has to pick one's way across a trail of use on the north (left) side. It's not too difficult, but it is a reminder of what happens when nature produces vertical cliffs. They don't last all that long in the big scheme of things. The amount of vegetation growing on this slide suggests it has been here for a few years. That's not true of the other slide I saw. 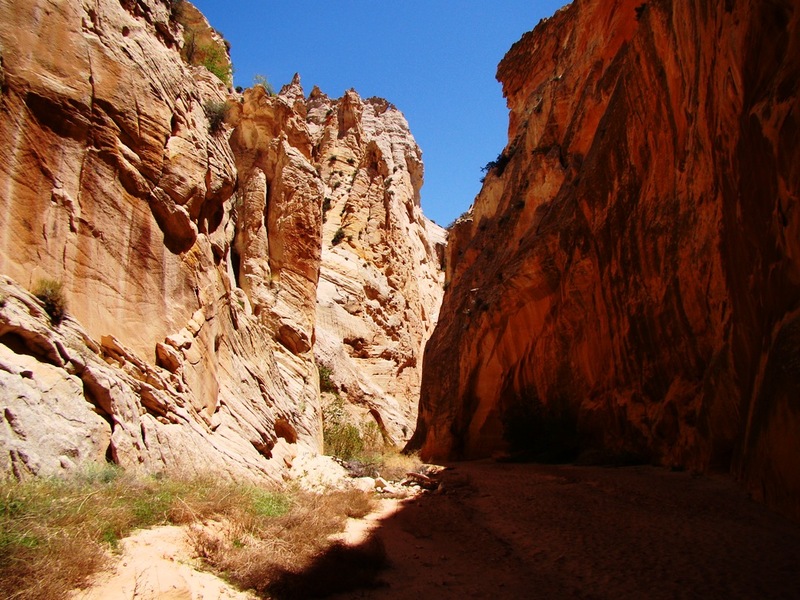 The most recent edition of Kelsey's hiking guide for the Paria Canyon region (2010) mentions a side canyon at the upper end of the Narrows that is easily explored. Not anymore...look below to see how it looked last week. No vegetation on it at all except a little patch of grass at the base. I can't find any information about the rockfall and would appreciate some additional info if anyone out there knows about when it happened. Most people know of Popeye the Sailor Man, through comics, cartoons, and even a movie. He was one of the most popular imaginary characters of the 1930s, and his exploits vis-à-vis Olive Oyl, Bluto and Wimpy are well-known. What is not so well known are his adventures later in life. 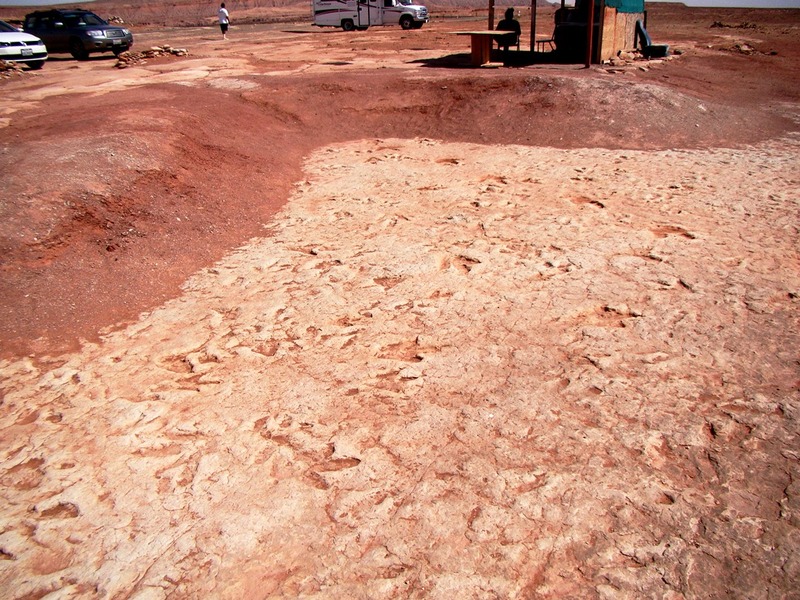 I was on my journey last week through the Colorado Plateau country, and we stopped at the Moenave Dinosaur Track Site. 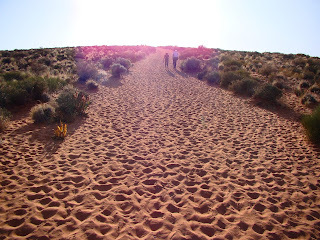 We stepped out into the bright sun amidst a flurry of dust and wind, and set out to find some Dilophosaurus tracks (with the help of our friendly Navajo guide). I could see another tourist off in the distance, and there was something familiar about him, but I just couldn't quite place him. This often happens with my former students; if I haven't seen them in a long time, and run across them in a grocery store or theatre, I won't remember their names at all. If they aren't in the classroom or lab, they are out of context. I considered this a moment, and realized in a flash that if this tourist had been on the deck of a ship, I would have recognized him immediately! The chin, the nose, the squint, it was all there. He'd gained some weight, but I could tell it was Popeye, the Sailor Man. We shook hands. "I love your work", I said, "You inspired me to always eat my spinach when I was growing up". His sunburned face reddened just a bit more, and he mumbled "Thank ya for the complyment". I couldn't help but ask, "The nearest coastline is a thousand miles away. Why aren't you out at sea?" He was quiet for a moment, looking reflective, and said "Walk wid me". "I had a pretty good life on the sea...the pay was good in them Great Depression years, and I helped folks laugh a little during the hardest of times" he said, "Things was simpler then, more black and white, so to speak. You could tell who the good guys was, and the bad guys, and if ya's kept enough spinach on hand, you could triumph over all manner of evils." We wandered past the massive rib cage of a T-Rex (at least our guide said that's what it was). "But as time went on, things began to feel, well, sort of futile. I believed in true love, and my love was Olive Oyl. What a woman! The sound of her voice, the smell of her freshly washed hair, the way she could light up a room with her smile." His smile faded a bit. "But I never seemed quite good enough for her. I would save her from death and disaster a hundred time over, and she always said she loved me, but then Bluto would show up, say a few words, and then she was gone again". "I'd head out to sea again, but over the years it never seemed to satisfy my longings the way it used to. Every so often I would feel, um, stirrings in my heart that maybe there was something out there, beyond the horizon, something that could bridge that void in my heart and mind". I must have given him a strange look because he glanced back and said "The sea is a wonderful place, mind you, but it's almost the same everywhere...always a flat horizon. Sure, there are the storms and the reflection of the clouds on the surface, but ultimately that's all there was...the surface. You knew deep things were going on down below, but it was so rare that you could see it or feel it all. There was water, there was air, and when the nets came up, there were fish. What kind of an existence is that?" I nodded. What could I say? He continued, "You know how the physics of 'toons work donchya? Someone hits you hard enough, you can fly right over the horizon, to some far place. That's what happened one day, when Bluto slammed me but good. I ended up in Arizona somewheres, out in the middle of the desert. I'd never seen no place like this, ever. Color everywhere, rocky cliffs, lizards and snakes and all. Normally I'da popped out that can of spinach and jumped right back inta the fight, but som'thin held me back. I had ta know more about this strange landscape, so I stayed on a bit. Oh, I eventually went back and beat the crap outta Bluto like usual, but it just wasn't the same anymore. Within a few weeks, I was in counseling with Bluto and Olive, and I told them I was over with the strange relationship. They could have each other, and I wished them happiness. I forgave Wimpy his hamburger debts (which I gotta admit were considerable), kissed Swee'Pea, and headed out for the Plateau country." 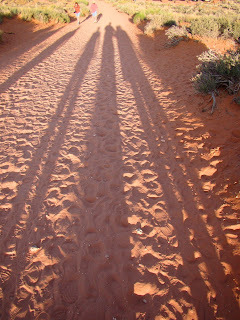 "The desert is wunnerful", he said with growing intensity, "it's got variety, it's got depth, it's got history. And best of all, there's the fossils. Not all hidden, like a treasure in Davy Jone's Locker, they could be just right there for all to see. 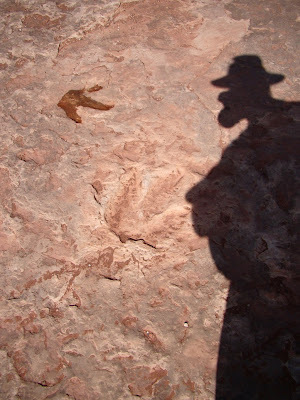 And what I like the most is, is the dinosaur tracks. A fish swims by in the ocean, and there's nuthin to record its passing. But here, 200 million years ago, some kind of dee-lofo-saur-us took a stroll, and left behind a trail. And so did a bunch of his buddies. I did me some research and found that folks that studies trackways and burrows is called ichnologists, and I realized that was what I was lookin' for all my life. I wanna be Popeye, the Ichnology Man!" We had walked past the Tyrannosaurus track, the crocodile skeleton, the triceratops skeleton, velociraptor teeth, the dinosaur coprolites, the dinosaur eggs (at least, that what our guide told us those things were), and I knew it was time to move on. I shook hands with the hero of my youth, and walked back to my car with a new perception of life's funny twists and turns. Popeye seemed happy after his fashion...he still mumbled and cursed under his breath, but with a lightness of being I had never noticed before. He was content. And I felt a little better about the world. My apologies to the creators of Popeye and to everyone else who has read this far! Sometimes you see an odd-looking picture, and a story just jumps into the imagination. The real tracksite is located on Highway 160 in Arizona, a bit over 5 miles east of the junction with Highway 89. There is a dirt road to the villages at Moenave, and the tracksite is just a few hundred yards off the highway. The dilophosaurus tracks are real, as is a small bit of claw embedded in the rock. There really were three dilophosaurus skeletons excavated close by in the 1940's. The guides will show you a lot of other things that are not quite so genuine. I suspect it would be bad form to point this out, in the same way that one wouldn't start spoiling a magic show by pointing out the tricks the magician is using. It's a tourist attraction, and they are making their living the same as the rest of us. 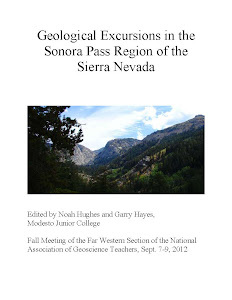 An excellent review of the site can be found in chapter 8 of Geology Underfoot in Northern Arizona by Abbott and Cook. I wasn't paying a whole lot to the eclipse business this last week. I knew we were well south of where totality would occur, and I just got back from a long trip, so I wasn't feeling up to driving four hours north. I just didn't think there would be that much to see down here in Modesto. In the early afternoon, I looked at the maps again and thought maybe it would be a good idea to grab the solar filter from our telescope at work, and got the tripod ready with my camera set on high zoom (30x). I was really surprised at what was visible today. 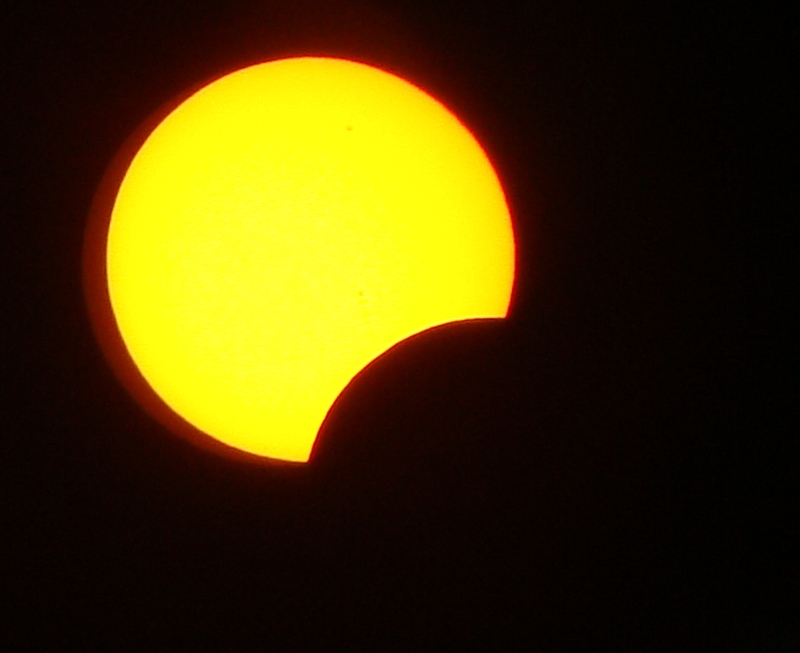 It was about as complete an eclipse as could be without seeing the total ring around the moon. Another 30 minutes later, the moon was moving past the sun and the sky grew brighter again. I love the little side effects of an eclipse. 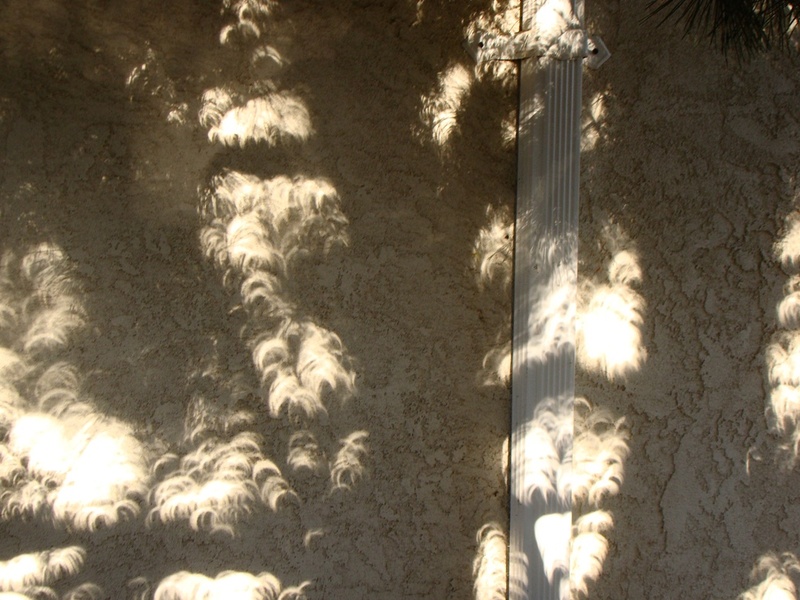 The stippled light shining through leaves forms thousands of crescents on the nearby wall. 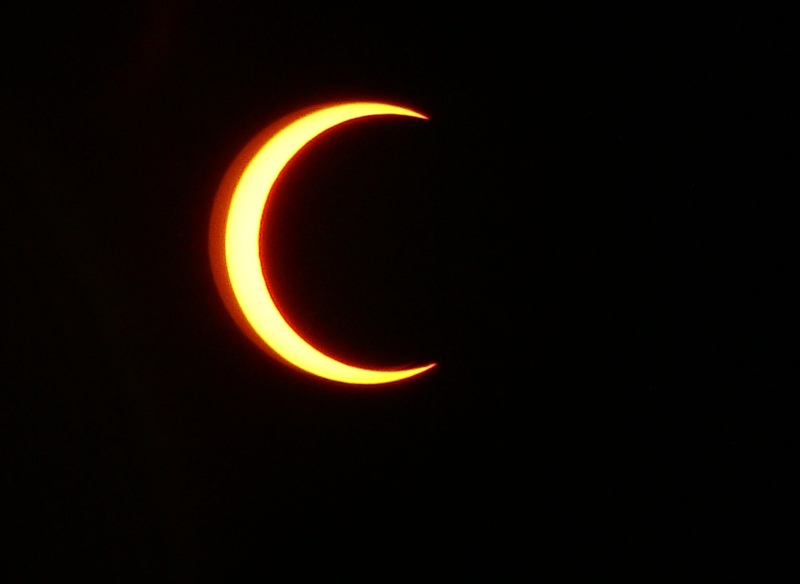 This was the best eclipse I've seen since 1991. 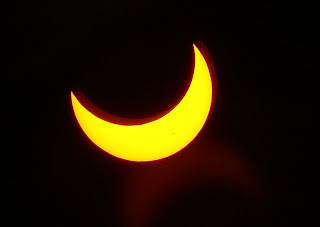 That year, there was a total eclipse that would touch on Hawaii and the south end of the Baja Peninsula. We thought of Hawaii, but a relative offered cheap rent at a condo in San Jose del Cabo, so we headed south. That turned out to be a good choice, as Hawaii was clouded over during the eclipse. We got the whole show from a vantage point on a high hill looking over twenty miles of tropical coastline. If you EVER get the chance to see a total eclipse, do it! The five minutes of totality in 1991 was one of the strangest moments of my life. The sun disappeared and stars appeared in the sky! The temperature dropped 15-20 degrees in a matter of moments. Looking at the event, I had little trouble appreciating the meaning that the ancients applied to eclipses. It was otherworldly; I almost found myself chanting for the dragon to release the sun from its prison! I'm sorry if you weren't living in the path of the eclipse. Enjoy these pictures, maybe, and start planning for 2017 in Oregon! It must have been so frustrating to be among the first Europeans to explore the Colorado Plateau, whether a Spaniard, a Mormon, or Mountain Man. It is so easy to get around on a vast plateau, because everything is so flat. Except that this is no normal plateau. Every time an explorer came to a river, it was almost always ensconced in a valley hundreds or thousands of feet deep, with vertical cliffs separating the travelers from the life-giving water below. Even worse, the deep canyons were a serious impediment to travel. Even as late as 1928, there was only one place where a vehicle could cross the Colorado River between Moab, Utah, and Needles, California, and that crossing was by ferry (Lee's Ferry to be specific). 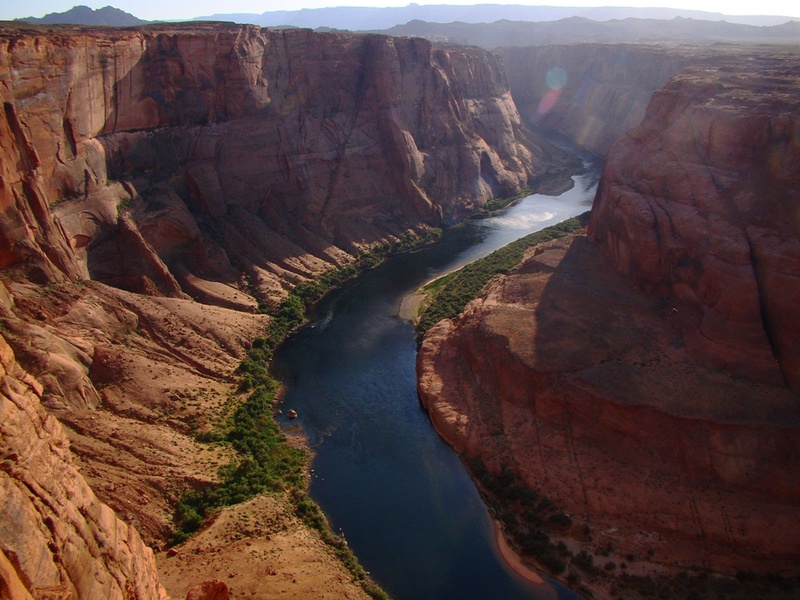 The rivers were just as confusing for the first geologists who explored the region, like John Wesley Powell, Grove Karl Gilbert, and Clarence Dutton. To geologists who had grown up with well-integrated river systems like the Mississippi or Ohio, these western rivers made no sense at all. The rivers crossed mountain ranges, or entered mountain ranges, only to swing around and exit the mountain range on the same side. The general landscape would slope north, yet the rivers flowed in canyons that sloped south. Huge abandoned dry channels littered the landscape, with no rivers anywhere nearby that could have carved them. It was a puzzle to be sure, but the work of Powell, Gilbert and Dutton to try and solve that puzzle led to our understanding of many basic principles of geology, including graded streams, antecedent streams, superimposed streams, base level, and isostasy. 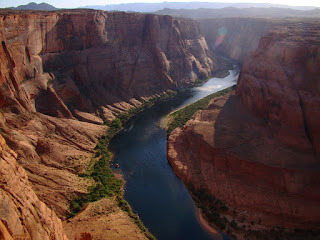 But as hard as they struggled, they could not completely comprehend the history of the Colorado River. Even today we still don't have a complete picture of how this landscape evolved. What we do know is astounding. For nearly a billion years, the earth's crust in this region has been near sea level and stable, but in the last few million years, that same crust was uplifted en masse some 2 vertical miles. Ancient rivers were rejuvenated, and new rivers formed as headward erosion tore away at the edges of the plateau. 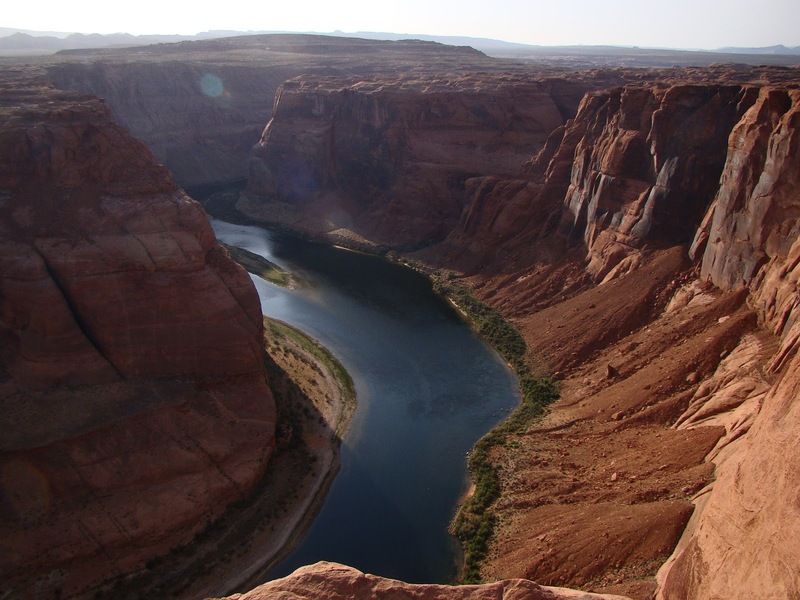 The entire river system that may have existed for tens of millions of years had been upended, and some rivers, the Colorado in particular, ended up flowing in a totally opposite direction of the original watercourse. The old meandering rivers were trapped in their channels as the land rose, so they cut straight down, maintaining the original river loops in what are called entrenched meanders. We were in the vicinity of Lee's Ferry during our reconnaissance journey last week. I was looking for interesting stops to add to our AAPG field seminar in July (a trip you are welcome to consider joining!). A volunteer at the Navajo Bridge Visitor Center pointed out that I might want to check out Horseshoe Bend outside of Page, Arizona. I have to admit I have never really explored Page all that much. I never got a chance to see the original Glen Canyon, and neither did anyone else except the few hundred people who had rafted the river through the canyon by the time that Glen Canyon Dam shut the floodgates in 1963. It was apparently one of the most beautiful river canyons in the world, but it now lies beneath hundreds of feet of stagnant water and silt. Page was the town where the dam workers lived during construction, and to me it represented everything that was wrong with the choices we've made in land and resource use (the giant coal burning power plant on the outskirts of town doesn't help). And with the ongoing decade-long drought, the dam and reservoir are in danger of becoming totally useless as far as their intended use as water storage and power generation. From the viewpoint at the end of trail, we are standing at the outer edge of one of the entrenched meanders, so we have the spectacle of the river running in a nearly complete circle. It's hard to photograph without a wide-angle lens, but it is an incredible sight. I was there at one of the harder moments to take pictures, though. The late afternoon sun was directly ahead of me, and it had been a dusty day, so all my pictures have lens flares galore. I can certainly imagine a serious photographer spending an entire day at this one spot, catching all the moods and sun angles. 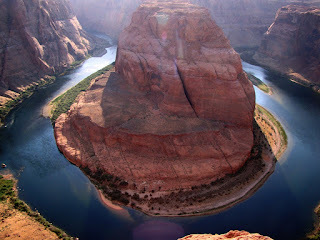 Horseshoe Bend is accessed along Highway 89 just a few miles south of Page, Arizona. There is a parking lot on the west side of the highway. 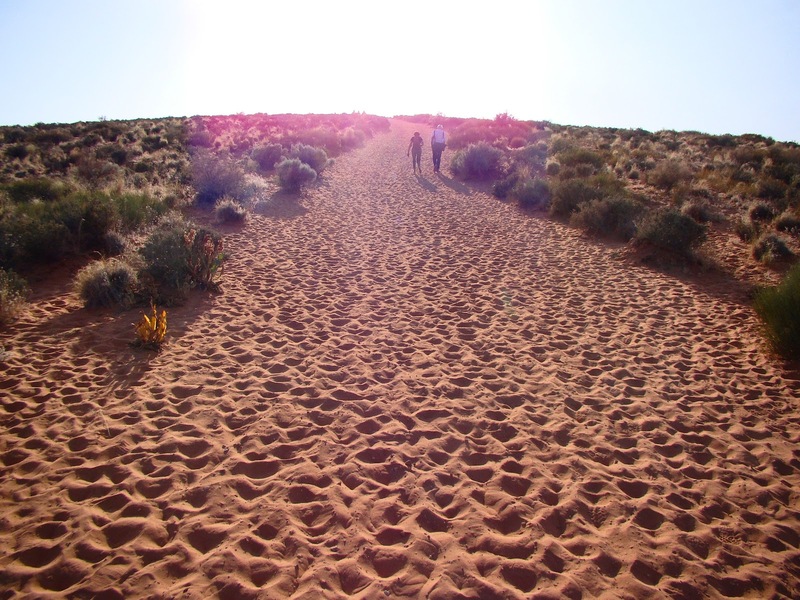 The hike is just 1.5 miles round-trip, but it is almost all in loose sand. Take water! I am home from a reconnaissance trip checking out the route of a proposed July 21-27 trip with the AAPG (although anyone is invited to join us). I came across some nice new localities, and I thought I would challenge some of my geography-expert readers to a bit of test. Here was the challenge: Name these parks and monuments! The point of the exercise was not to foster any competition, but to help folks realize that there is far more out there on the Colorado Plateau than those big three parks that are on the tourism bus routes. It is staggering to think of how many beautiful places can be found just a few feet beyond the resort areas of the biggest and best-known parks. 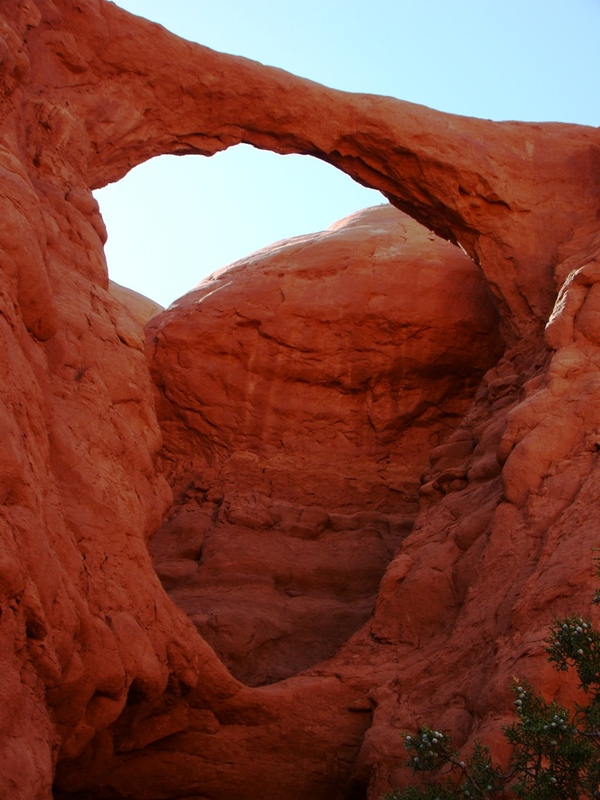 1) The clue: The arch above is formed in the Entrada sandstone of Jurassic age. The answer: Kodachrome Basin State Park, Utah. Kodachrome is a great little park with some odd features (explained below), but it also includes a nicely proportioned arch (Shakespeare Arch). 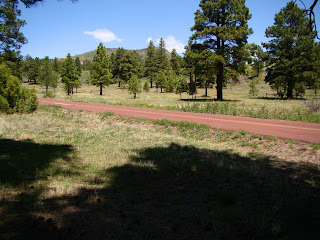 It is along a 1/2 mile trail in the southeast part of the park. 2) The clue: The folks who manage the ruins above claim them to be the single most visited archaeological site in the United States. 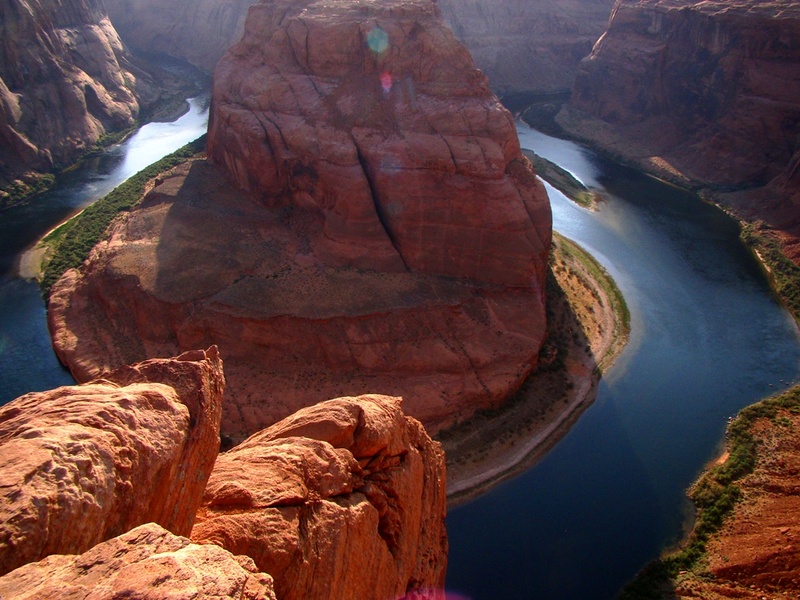 The answer: Grand Canyon National Park, Arizona. Grand Canyon is not famous for its ruins and archaeology, but the park has a rich record of past human habitation. 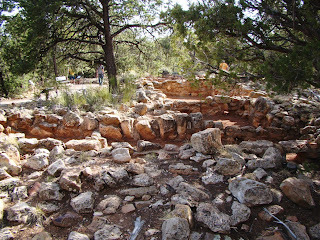 Tusayan Ruins are at the eastern edge of the South Rim, and have been developed into a small museum and trail. 4)The Clue: The rocks above may actually be parts of two or three parks. 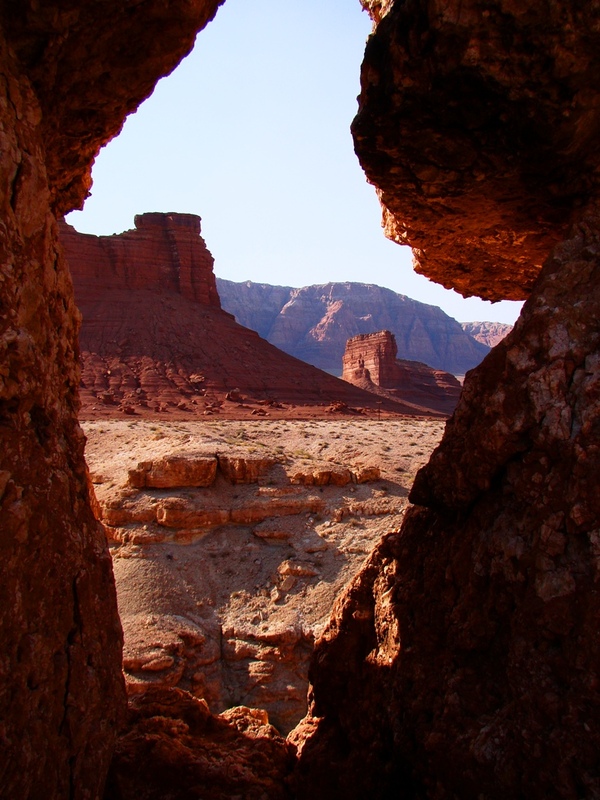 The Answer: Vermilion Cliffs National Monument, and possibly Lake Powell National Recreational Area. The Vermilion Cliffs stand high above the Colorado River at Lees Ferry and Navajo Bridge. 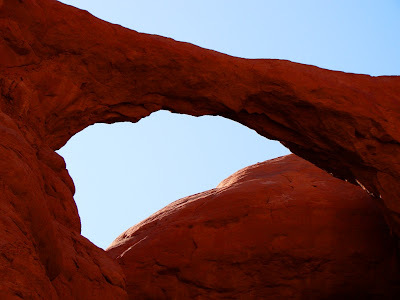 There is quite the contrast between the two parks: the Vermilion Cliffs are isolated, and practically without roads or trails while Lake Powell is an artificial reservoir that promotes all manner of tourist pursuits. This picture was taken from a low ridge by Navajo Bridge, where one can stand in the center of the span and look down hundreds of feet to the river. For years Lees Ferry was the only water-level crossing of the Colorado River for hundreds of miles. 5) The Clue: What are those white cliffs in the distance? The Answer: Zion National Park. Most visitors to Zion National Park only tour the valley floor without realizing that the park is much larger. Paved roads reach two of the isolated corners at Kolob Terraces and the Kolob Fingers. 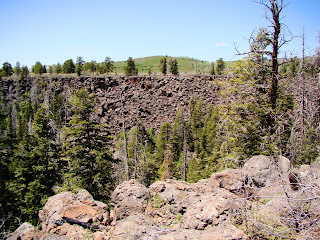 On the Terraces, one can access Lava Point, one of the highest points in the park. From the overlook, one can see the rim of Zion Canyon and the rather vast forested wilderness beyond the rim. The Answer: Grand Canyon National Park. If you've ever breathlessly struggled up the Bright Angel Trail, you may have missed the significance of the final switchback before the rim. The trail utilizes the fault line to cross some of the more difficult cliffs in the canyon. 7) The Clue: The spires could be called hoodoos, but they aren't, usually. The Answer: Kodachrome Basin State Park, Utah. The small state park preserves unusual features called pipes, whose origins are enigmatic. The pipes sometimes recall the spires and hoodoos of nearby Bryce Canyon National Park, but they formed differently. 8) The Clue: The unmistakable clue is the color of the road. The Answer: Zion National Park. Nothing in this picture seems to recall Zion National Park, as there are few conifers or meadows on the valley floor. But there is one constant: the red road. Zion engineers use red cinders in the roadbuilding process, and thus the roads mesh better with the overall visual environment. 9) The Clue: Basalt lava flows in a park not usually associated with volcanism. The Answer: Zion National Park. Cenozoic lava flows cover parts of Zion National Park, but the rocks are only seen along the Kolob Terraces Road or downstream, out of the park boundaries. 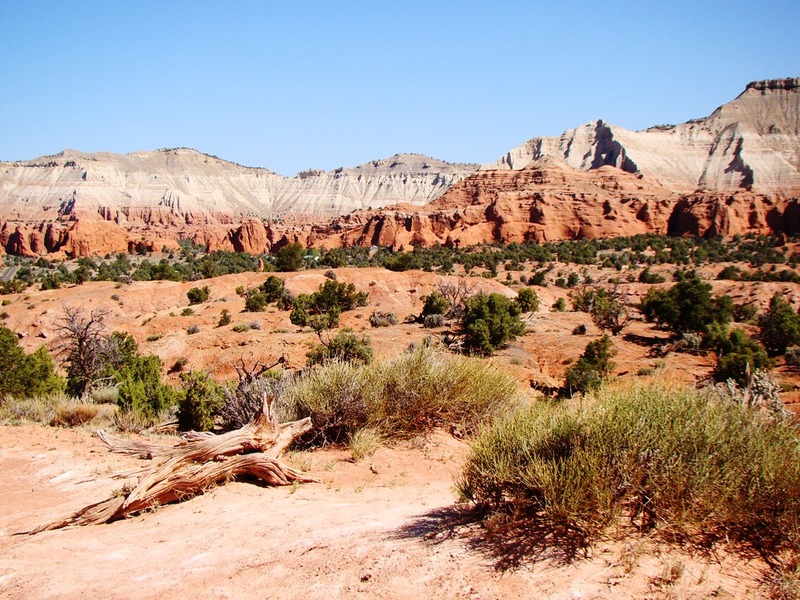 The Answer: Grand Staircase-Escalante National Monument. 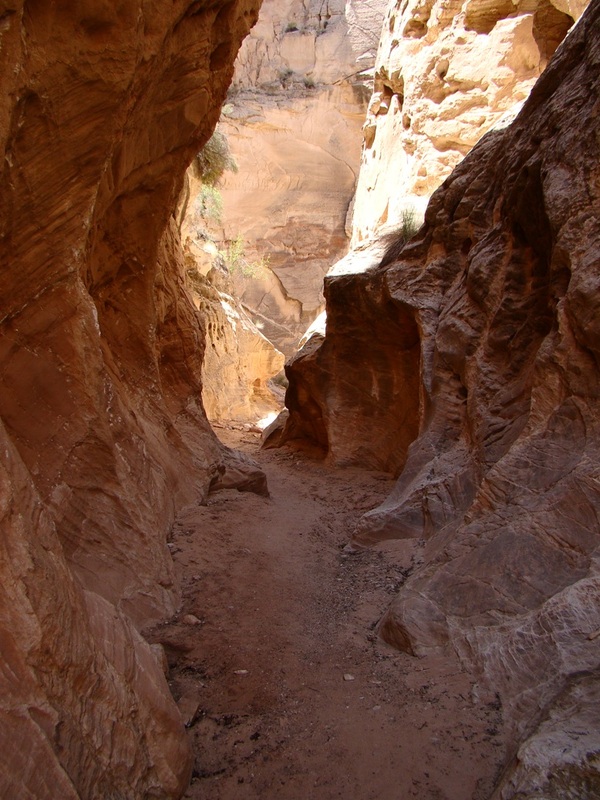 Cottonwood Wash has a short stretch of narrows cut through the Navajo Sandstone, which forms high cliffs and deep slot canyons. This one is in Cottonwood Wash, and has a nice 1 1/2 mile trail. These parks are great places to visit! 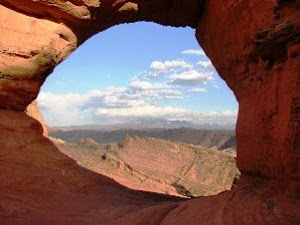 1) The arch above is formed in the Entrada sandstone of Jurassic age. 2) The folks who manage the ruins above claim them to be the single most visited archaeological site in the United States. 4)The rocks above may actually be parts of two or three parks. 5) What are those white cliffs in the distance? 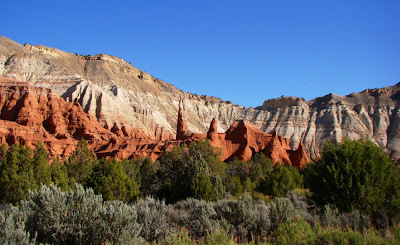 7) The spires could be called hoodoos, but they aren't, usually. 8) The unmistakable clue is the color of the road. 9) Basalt lava flows in a park not usually associated with volcanism.